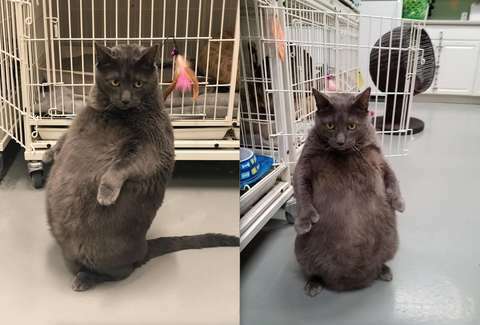 Bruno is a lovably rotund cat from Grove, Illinois, and he needs a home. The 7-year-old lump claims he is "TOO COOL TO BE HOMELESS" in a post written on the Wright Way Rescue shelter's Facebook page, but there's one thing he needs you to know before you welcome him into your living room: Bruno has needs. Bruno isn't like other cats. For one thing, he often stands on his hind legs and sticks his belly out, which makes him look like Tony Soprano. (He says he's on a diet). But there's more to Bruno. In the post, which is presented as if he penned it himself, Bruno makes clear that he's fickle. For one thing, don't pet his belly: "I like to be pet on the top of my head and spine only. I know my tummy is so tempting to touch, but I would prefer if you didn't. I may swat my hand and pretend to bite if you do." Damn, that's pretty testy Bruno. But go on. The cat claims he's vocal, meaning he'll meow and probably stand on his hind legs to let you know he's hungry (for food that fits his diet). He prefers one toy, his feather wand. He'll sleep in your bed with you, and make sure to give you enough room to stretch your legs, because he's considerate. Feeding Bruno also requires more involvement than it does with other cats: "I love to be pet while I eat. It took my foster mom a little time to realize what I was meowing about, since she had just put food in my bowl. Soon she found out it's because I want pets while I eats! I will still eat if you don't pet me, but I will meow more and stare at you for a while...I also drink a lot of water." Keep in mind, we haven't even hit all the bullet points yet. Bruno says 1) he doesn't drink water in the kitchen, but "in a completely different room" of your preferably large house, 2) likes to lay on the floor, but will curl up in your lap when the mood strikes, 3) prefers pets "on the sides of my face and neck" 4) and lastly, Bruno realizes that he's "EXTRA." All of this to wit, and the cat still insists that he's "laid back" and "lazy." Bruno, you do seem "EXTRA" to be perfectly honest, but that doesn't mean you and your potbelly don't deserve a home and owners privy to your dietary restrictions. Raising you is a labor of love. I wish you the best of luck, and godspeed.